Since it is a little outside Prague’s typical tourist perimeter, Vítkov is a place many people choose to skip on their first visit. Unfairly so, I would say, because it is truly one of the places that reflects several important epochs of Czech history, both good and bad. The hill itself became famous as the setting of an important Hussite battle during the Protestant reformation (honoured by the huge equestrian statue). 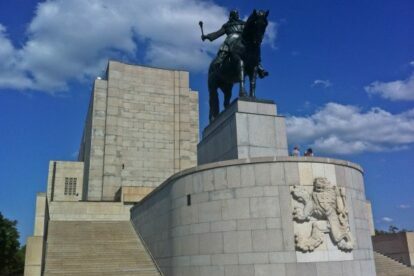 Later, during the interwar years, a massive monument was built to honour Czechoslovak soldiers during WW1, which was later “rebranded” and turned into a mausoleum for communist president Klement Gottwald. Nowadays the monument belongs to the National museum which offers a fairly interesting and interactive exhibition focusing on important 20th century milestones. There are several other reasons why I love to wonder in the direction of Vítkov – one is the peculiar view of the neighbouring Žižkov with the impressive TV tower, and another is to stroll around on the fairly well hidden asphalt path ideal for running or inline skating that goes along the foot of the hill, above street level. For a pleasant walk, I would recommend starting at Karlín, taking the eerie tunnel up towards Vítkov, which is sure to send shivers down your spine, then turning towards the entrance to the park and immediately right again onto the path. Walking on the path you will be led past the famous pub U Vystřelenýho oka, by the railroad tracks, ending in front of the University of Economics.